As someone who has been lifting weights regularly for years in my basement, I often wonder if a set of resistance bands could be an asset for my home gym. Could I use it to replace my dumbbells? Is it for experts or beginners? Throughout all these years of my training, I have come across dozens of resistance bands that exist on the market today. Indeed, I had great difficulty making up my mind which kind of resistance bands is the right one for me. 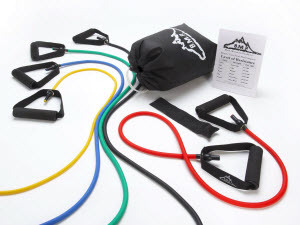 My research led me to the “Black Mountain Products Resistance Band Set”. However, can these resistance bands provide me with a very good fitness exercise? Can they also build my core muscle groups and improve my physique? I took some time to get into every detail and aspect of this fitness equipment and I am reviewing this device in the lines below. How Does the “Black Mountain Resistance Bands” Work? With any resistance bands you have the capability to do a full body workout and to tone and strengthen your muscles. You can also understand that some resistance bands are better than others. “Black Mountain Products Resistance Bands” are a great alternative to free weights or any workout machine. They not only exercise your abs, chest, arms and back in the best way, they are also the perfect tool for general rehabilitation of any part of the body. The “Black Mountain Products Resistance Band Set” provides you with the opportunity to enjoy a full-body exercise at home that requires very little storage space. They are also compact and portable which means that you have the opportunity to workout anywhere. What I found exciting and innovative in these resistance bands is, that different colors signify different resistance levels. Even more, by using a clip, you can attach several bands to one handle and increase the resistance level. Another feature that impressed me is that they offer a progressive resistance level. That simply means that they are ideal for everyone, whether he is a beginner or an expert. As far as the guidelines are concerned, you do not have to worry since the package includes a booklet that explains what to do with the exercises. What Others Are Saying – Does the “Black Mountain Resistance Bands” Really Deliver? It is remarkable that this kind of fitness equipment can be literally used anywhere. An individual called Candace Johnsoon travels a lot and he uses them while he is away from home. In that way, he remains motivated and fit even when he is not in his personal space. He points out that he gets a great workout in his hotel room”. Amongst the benefits that this product offers is the rehabilitation that anyone can get during his physical therapy. You can sculpt your body and strengthen your back with the resistance bands. 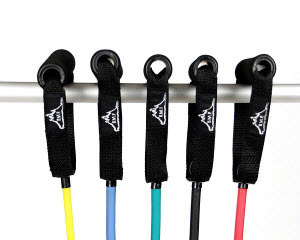 One of the users of these resistance bands descibes the variety that they can bring to his fitness exercises both in the present as he is recovering and in the future as well. He gives also emphasis to the value for money that this product represents, when he says: “The quality surprised me for the price”. It is also really amazing how well-made and how sturdy they are while you use them. The resistance level is perfect for both beginner and more advanced levels. A customer named Guerra, while describing his experience with these bands he acknowledges that they have given him an "excellent workout". In the video below, you can watch a fitness expert describing the kind of workouts that you can do with the "Black Mountain Resistance Bands". Will “Black Mountain Resistance Bands” Help Me stay fit? Resistance bands can help you to build muscles and make a fit body in a short period of time. It is indeed astonishing that if you perform regular resistance bands training you will strengthen and tone your muscles and increase your bone mass. Bear also in mind, that if you perform this exercise poroperly, resistance bands training can give you significant functional benefits and improvement in your health and well-being. The biggest complaint about these resistance bands resides in how easily they break. It is even more worrying that they break in a very short period of time since you start practicing. The biggest problem is found in the place where the elastic attaches to the handles, which explains why they break so easily. Even if you apply very little pressure, you may disconnect the band from the handle and thus you “render the product useless”. At this point, I have to note that the “Black Mountain Resistance Bands” is suitable for the fitness program P90. It is indeed true that these resistance bands are much more effective and efficient for the P90 program rather than multiple sets of weights or one adjustable weight set. Additionally, Black Mountain resistance bands are inexpensive to buy, very easy to store and very easy to just take them out and have a quick 10-min or 15-min workout, even twice a day. For this exact reason, resistance bands can be used as a great way to motivate yourself in the morning or any other time during the day. 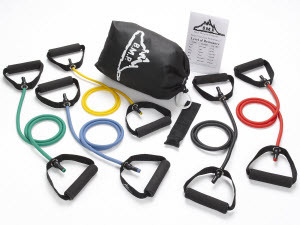 The “Black Mountain Resistance Band Set” has been given a 4.5 star rating. The general user response was positive and indeed most people like it. Out of 339 customer reviews, 220 of them gave this product a 5-star rating and 84 of them gave a 4-star rating. 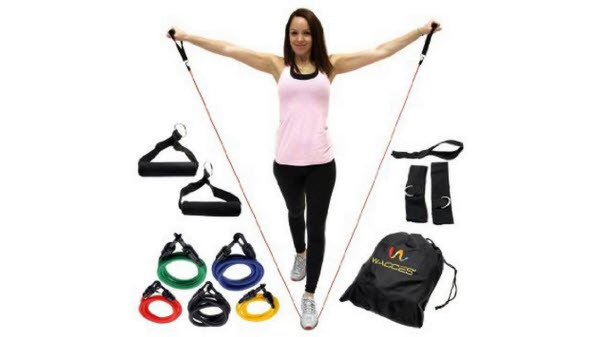 If you have decided that you are interested in burning your calories and building your core muscles with the “Black Mountain Resistance Bands”, you can buy this product at a great price on Amazon.com. lf you want to learn as many details as possible through customer opinions about this simple and effective product.